The Berlinale Festival Shopper by Brandcraft not only put in a first-class performance at one of the most important well-attended film festivals in the world, but also at the Promotional Gift Award 2018. 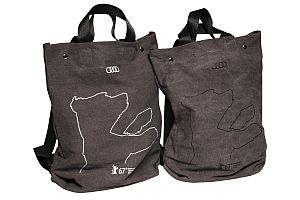 The bag that was designed together with the KMS team on behalf of Audi AG is made of waxed organic cotton and combines the advantages of a spacious shopper with those of a practical rucksack. 26,000 copies of the model with different prints were produced, the interior offers sufficient room to store a 15” laptop. Last, but not least the outline of the official bag for the 67th Berlinale is designed in the form of the Golden Bear – the competition’s trophy. The bag went down extremely well with the festival attendees and the Promotional Gift Award jury, who promptly presented the shopper with an award in the category Custom-made Designs. Thanks to the discrete branding, the brands Audi and Berlinale don’t push their way to the fore, but instead let the elegant simplicity of the model speak for itself. In this way, Brandcraft has created a high-quality, stylish messenger that delights film fans with its unconventional design and manifold fields of application.